Petit Trianon (Small Trianon), built between 1762 and 1768 during the reign of Louis XV, is a small château located on the grounds of the Palace of Versailles in Versailles, France. The park of the Grand Trianon includes the Petit Trianon. It was designed by Ange-Jacques Gabriel by the order of Louis XV for his long-term mistress, Madame de Pompadour, and was constructed between 1762 and 1768. Madame de Pompadour died four years before its completion, and the Petit Trianon was subsequently occupied by her successor, Madame du Barry. Upon his accession to the throne in 1774, the 20-year-old Louis XVI gave the château and its surrounding park to his 19-year-old Queen Marie Antoinette for her exclusive use and enjoyment. The château of the Petit Trianon is a celebrated example of the transition from the Rococo style of the earlier part of the 18th century, to the more sober and refined, Neoclassical style of the 1760s and onward. Essentially an exercise on a cube, the Petit Trianon attracts interest by virtue of its four facades, each thoughtfully designed according to that part of the estate it would face. The Corinthian order predominates, with two detached and two semi-detached pillars on the side of the formal French garden, and pilasters facing both the courtyard and the area once occupied by Louis XV's greenhouses. Overlooking the former botanical garden of the king, the remaining facade was left bare. 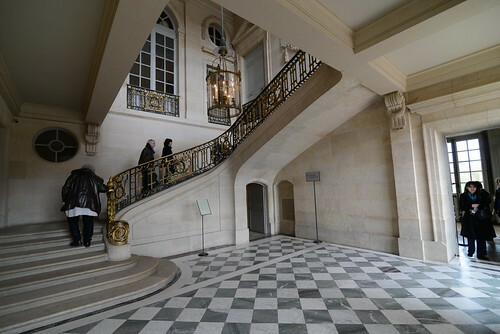 The subtle use of steps compensates for the differences in level of the château's inclined location. Marie Antoinette would come to the Petit Trianon not only to escape the formality of court life, but also to shake off the burden of her royal responsibilities. At Versailles, she was under considerable pressure and judgement from both her family and the court, and the Petit Trianon was her place of ease and leisure where she could rest from those trials. Since all was "de par la Reine" (by order of the Queen), none were permitted to enter the property without the Queen's express permission (not even, it was said, Louis XVI). Such exclusivity alienated the court nobility, which she did very willingly, since only the queen's "inner circle" (including the Princess de Lamballe, and Gabrielle de Polastron, duchesse de Polignac) were invited. A house of intimacy and of pleasure, the building was designed to require as little interaction between guests and servants as possible. To that end, the table in the salles à manger was conceived to be mobile, mechanically lowered and raised through the floorboards so that the servants below could set places sight unseen. The tables were never built, but the delineation for the mechanical apparatus can still be seen from the foundation.